What kinds of trips do we specialize in? We cater to mostly privately guided groups and put together customized trips based on the type of skiing they like to do, either freeride or backcountry focused. Often trips combine both. We do have a number of scheduled trips for single or couples. If you are a single or couple, or would like a customised itinerary, please inquire. We regard freeride skiing as off-piste riding at the resorts. We still recommend skins for these trips to make the most of untracked snow that we can access, but the focus is skiing and getting as many quality turns as we can. Backcountry skiing is mostly non-lift accessed skiing, where we will be skinning for turns in more remote locations. It may include a one ride up on the lift at the start of the day. How do I access Hokkaido? For skiing in the Niseko area, we recommend Chitose International Airport. For skiing in the central Hokkaido area, we recommend flying in to Asahikawa Airport. How long does it take from the airports to Niseko and Furano? It takes 2.5 hours from Chitose to both Niseko and Furano. It takes an hour from Asahikawa Airport to Furano. Generally it snows more around the resorts in the western area of the island, although Kurodake and Asahidake get similar amounts of precipitation due to their higher elevations. It will snow between 13-16 meters per season in SW Hokkaido. At the resorts In central Hokkaido it is about 9 meters a season. In Daisetsuzan National Park, it snows as much as the west coast areas, again due to higher elevations. 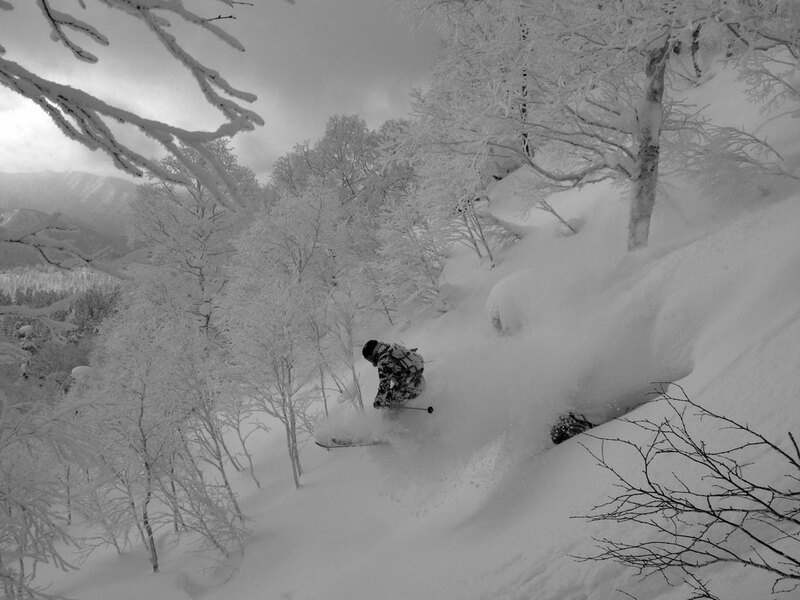 The powder season in Hokkaido is January and February. There is still good powder in early March in Central Hokkaido, and in to early April in the Daisetsuzan National Park, but is a little more backcountry focused. How do we freeride ski Hokkaido? For freeride we recommend skiing in the high precipitation area of South West Hokkaido. For this area, we will accommodate clients in Niseko. For the Central Hokkaido area, we accommodate clients in Furano. In the latter part of February, Asahikawa can be a good option to access both Kurodake and Asahidake. All the resorts get different amounts of snow depending on which way the wind is blowing. We will usually make the decision on the best resort to ski for the day based on the weather and snow conditions. What resorts can be accessed from Niseko for freeride skiing? The resorts of Moiwa, Kiroro and Rusutsu can be accessed from Niseko. All resorts are an hour or less drive from Niseko. What resorts can be accessed from Furano for freeride skiing? The areas of Asahidake, Kamui Ski Links and Tomamu. Resorts are between an hour, to an hour and a half drive from Furano Ski Resort. What is the average elevation of the resorts? The resorts are around 1,000 meters in elevation and typically provide between 500 to 1,000 meters of vertical skiing. The exception is Asahidake and Kurodake in the Daisetsuzan National Park with lifts that will take you to 1,520 and 1,600 meters respectively. What is a typical ski day at a resort? We are looking to ski all untracked all day. Due to the small resorts, we may skin for a part of the day once it is tracked from the lifts. These are short skins of 20-30 minutes. If we can get fresh powder from the lifts all day, then we will. Read this journal entry for more information. What about backcountry skiing in Niseko? There is good backcountry skiing on Mt Yotei, which provides about 1,300 meters of vertical on a good day. The top few hundred meters are typically wind affected to the point of being not skiable. On a clear day it is possible to ski in to the crater for an unforgettable ski experience. There are surrounding mountains notably in the Annupuri Range that provide good tree skiing terrain. How about backcountry skiing in Central Hokkaido? Weather is generally more settled than the western region of Hokkaido and the snow can be exceptionally light and dry. The Daisetsuzan National Park is the main focus with the highest mountains and a few live volcanoes in Hokkaido. Elevations are around 2,000 meters and the start point is at 1,000 meters. The tree line is about 1,350 meters, so can be limited when the weather is adverse. There are a number of other ranges that can be accessed from Asahikawa and Furano that are better options when the weather limits skiing to tree line high up. There are, but are little more than summer shelters. There are hot spring hotels above 1,000 meters in Tokachidake at the southern end of the Daisetsuzan National Park. When the weather is good it is convenient to stay in the park, although we find that there are more options to have clients stay in Furano. How much vertical do we typically ski on backcountry days? An average day may be 1,000 meters but will depend on the weather and the group. The mountains will provide anything from 400 to 750 meters vertical descents, or around 1,300 meters on the volcanoes. Do you use snowmobiles to access more isolated backcountry terrain? For our backcountry trips we do. This will involve a tow in across the approach which may be anything up to 6 km. There is heliskiing on the mountain of Shiribetsudake which is next to Rusutsu Ski Resort. Terrain is steeper than much of the terrain around the Niseko area. The operation will fly more around the end of February and March due to more stable weather. There are a number of operations mostly in the south west area of Hokkaido and Niseko. With the exception of Shimamaki, these have been set up on ski resort terrain that have gone out of business. In the Central Hokkaido area there is Tengu Cats and an operation in Tomamu. What are the typical temperatures? Dress for around -10 degree Celsius temperatures. It will get colder at the higher elevations of Daisetsuzan National Park and sometimes for a brief period there can be -30 degree temperatures, but we haven’t had those for a few seasons now. When the winds are blowing from the north, conditions can be frigid. What equipment is needed for tours? The usual avalanche safety equipment such as beacon, probe and shovel are needed. Avalanche safety packs are of personal choice. We recommend ski crampons and boot crampons for our volcano trips as it can get firm on the ridges at higher elevations. Ice-axe and harness are not necessary. What is the risk of avalanche? The avalanche risk is generally low. A deep and uniform snowpack, together with consistently low temperatures produce a uniform and stable snowpack. What kind of terrain do we ski? There is alpine terrain in the Daisetsuzan National Park. For the most part skiing will be in the trees which are generally well spaced. We can ski anything from volcano craters, bowls and the occasional chute. Pitch is generally around 30 degrees. What ski width is recommended for Hokkaido conditions? Any skis over 100 mm is fine, although we recommend 110- 115 mm at the waist. Anything wider can be tricky skinning on firm conditions. Are there wide ski rentals available in Hokkaido? Yes. There are rental shops that provide wide touring skis with skins. Are there split board rentals? Yes. These can be rented in Niseko's Hirafu Village.